Anthony Joshua's next fight will be against Russian Alexander Povetkin, promoter Eddie Hearn has said. 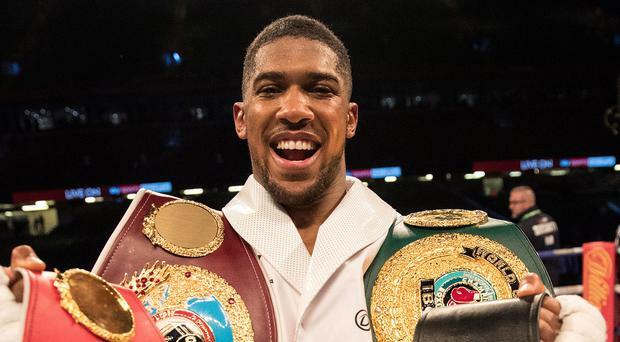 Joshua was yesterday morning given a 24-hour deadline to sign to fight Povetkin or face being stripped of one of his world heavyweight titles. Hearn has been negotiating for a unification bout with WBC holder Deontay Wilder, but the WBA have lost patience and want him to face their own mandatory challenger. WBA president Gilberto Mendoza said in a statement: "Today the WBA requested an answer from Anthony Joshua's team regarding his fight with mandatory challenger Alexander Povetkin. "The WBA have allowed over a month extension to negotiations with Povetkin and also ongoing discussions with Deontay Wilder. "It appears the Wilder team have not returned the contract for the fight and therefore we are requesting a date for the Joshua versus Povetkin fight." Hearn had indicated he was close to agreeing a deal with Wilder, but the American's team claim to be holding out for "clarifications". An irked Hearn said: "We can't do a lot more. I think Anthony's frustrated that he feels people feel he might not want the fight (with Wilder). He wants that fight more than anything. "We sent the contract nearly nine days ago. We're not even necessarily expecting a signed contract back - we just want comments. If I wanted a fight, my fighter wanted a fight, and we received a contract, we would be back with the comments within 24 hours. Nothing makes sense here at all. "(Team Wilder) emailed me on Sunday and said, 'We will be back with our comments on Friday'. Why do you need another five or six days? "They know we're under pressure from the WBA and it all feels like a big game. "We're not going to give up a belt, and if Povetkin's ready to go, that will be next." Povetkin, who held the WBA's 'regular' title between 2011 and 2013, beat Briton David Price in March on the undercard of Joshua's win over Joseph Parker. The Principality Stadium would be favourite to host Joshua v Povetkin, confirmation of which would delay a clash with Wilder until at least next year. Jarrell Miller has said he “messed up” after reported drug test failures forced an upcoming fight with Anthony Joshua to be scrapped. By Declan Taylor Should Amir Khan send a shockwave through world boxing by beating Terence Crawford in Manhattan tonight, the Bolton man will have more to thank his wife Faryal Makhdoom for than usual.